Notes: Knight of the Garter. The Complete Peerage, Vol.XIIpI,p454. Charles Brandon had an inauspicious beginning and his rise to wealth and prominence was due largely to two things: his father's death at Bosworth Field and his own personal magnetism. Upon his death in 1545, Brandon was perhaps the only person in England who had successfully retained Henry VIII's affections for over forty turbulent years. His father was William Brandon, Henry Tudor's standard bearer at Bosworth Field in 1485. He was reportedly killed there by Richard III himself. Around 1480 or so, William had married Elizabeth, the daughter and heiress of Sir Henry Bruyn of South Ockendon in Essex. But, unlike his respectable, middle-class forebears who had led exemplary - and cautious - lives, William had a taste for politics. When the Duke of Gloucester usurped the throne in 1483 and declared himself Richard III, William and his younger brother Thomas decided to make a stand. They joined the Duke of Buckingham's rebellion; it failed and the brothers fled to Brittany where they joined other Lancastrian exiles who supported Henry Tudor, the Earl of Richmond. When William fled England, his wife was already pregnant. Charles Brandon was born sometime in late 1483 or early 1484. He had an older brother, William (1476-1497), and two younger brothers, Sir Thomas and Sir Robert. His mother died in childbirth and, upon his grandfather's death in 1491, the orphaned boy went to the royal court. This was the custom of the time but since Brandon was not heir to an important title or great wealth, his case was decided more on sentiment - he had a claim on Henry Tudor's affections since his father had died in his service. That demonstration of loyalty at Bosworth meant a great deal to the first Tudor King. Since Charles was just two years older than Henry's first son, Prince Arthur, it is probable that they were playmates. When Arthur married the Spanish princess Catalina de Aragon in 1502, his court moved to Ludlow Castle in the Welsh Marches (the traditional seat of the Prince of Wales.) Charles did not accompany the royal couple; instead, he remained in London as companion to Arthur's younger brother, Henry Duke of York. Though seven years older than Henry, Charles shared his most prominent characteristics - natural athleticism, robust physical health (unlike the delicate Arthur), and a devotion to all sports (wrestling, hunting, tilting and jousting, etc.) During these adolescent years, the two boys laid the foundation for a lifelong friendship. Arthur died just months after his wedding and, in 1509, the Duke of York succeeded to the throne. This marked the real beginning of Charles Brandon's rise to prominence and privilege. But before 1509, young Charles had undergone an embarrassing marital situation which revealed his ambition and callousness. In 1505, after Sep 25, he had become engaged to Anne Browne, a young woman of impressive lineage - her father was Anthony Browne, Governor of Calais, and her mother was Eleanor Oughtred. They both lived in the household of the Earl of Essex c.1506. Charles and Anne were betrothed 'per verba de praesenti', a binding contract under canon law. In such cases, there was no ceremony or witnesses; as one can imagine, this led to several unpleasant cases of men and (more rarely) women repudiating their betrothed - if they lacked proper respect for church law. Charles apparently did. He and Anne slept together, as evidenced by the birth of a daughter, Anne, in 1506, but he did not marry her. Instead, he married her aunt, a very wealthy widow named Margaret, the daughter of John Neville, Earl of Northumberland and the widow of John Mortimer. 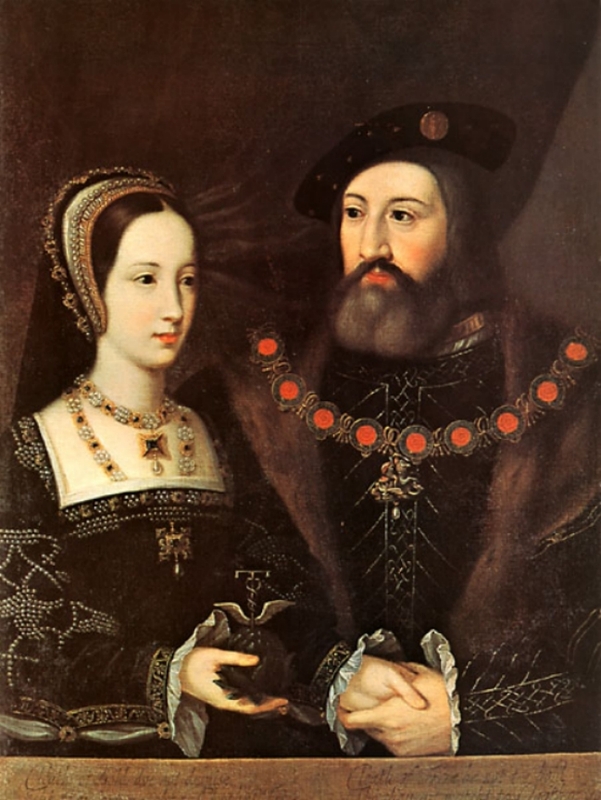 They were married before Feb 7, 1506 and the marriage was later dissolved in 1507. The marriage was never taken seriously due to its mercenary nature and, more importantly, legal action begun by Anne's angry family. Eventually, the Mortimer marriage was annulled due to the previous contract and Charles married Anne in a well-attended public ceremony about 1508. They had another daughter, Mary, in 1510; Anne Browne died just two years later. Anne Brandon (d. Jan 1557) married firstly Edward Grey, Lord Grey of Powis and secondly Randle Hansworth; and Mary Brandon (d. about 1542) married Thomas Stanley, Lord Monteagle (possibly one of the Holbein portraits in the Windsor collection may be of her - it is entitled Lady Monteagle and she would be about the correct age). By late 1512, Charles had recovered from his grief enough to contemplate yet another union. This was perhaps even more mercenary since his betrothed was an eight-year-old orphan. It was common practice for the Crown to assume guardianship of an orphaned minor child who had inherited property. The Crown then sold the guardianship to the highest bidder, often the child's own relatives who wanted to receive the property revenues until the child came of age and decide whom they would marry. Charles had been given the wardship of Elizabeth Grey, the heiress to Lord Lisle of Sparsholt in Berkshire. This, along with various offices, grants & pensions, was a mark of Henry's continued favor. In early 1513, Charles announced his engagement to the girl and, on 15 May 1513, the King created him Viscount Lisle, in right of his betrothed wife. Charles Brandon finally had a noble title and even more property. He began to use the title, but was forced to give it up when the contracted marriage failed to take place. She would later marry Henry Courtenay, Earl of Devon, later Marquis of Exeter. That same year, the new Lord Lisle accompanied the King to France and also helped entertain the Hapsburg Emperor Maximilian and his twice-widowed, 33-year-old daughter, Margaret, Regent of the Netherlands. For Henry, the meeting was also a diplomatic necessity since, in 1508, his father had entered into a formal contract of marriage between his youngest daughter, Mary, and Maximilian's son, Charles of Castile. But over the next few years, little mention had been made of the contract. 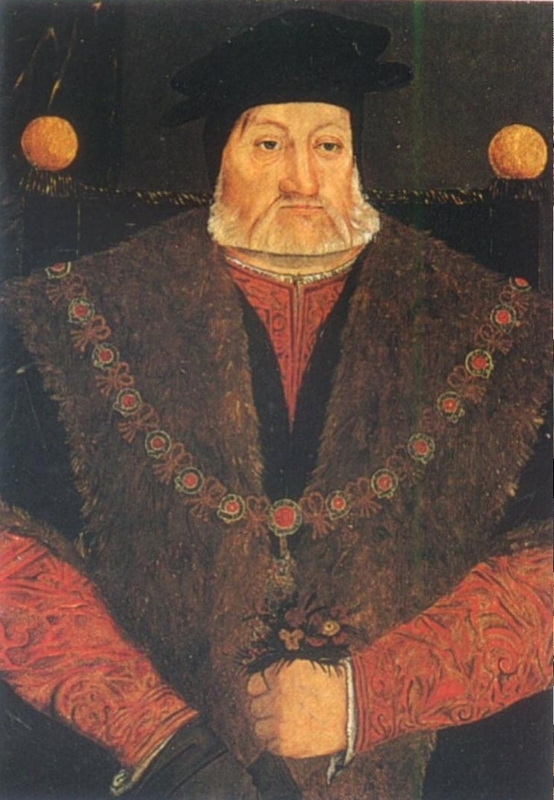 Henry used the visit to broach the subject; the end result - Princess Mary and Charles would wed in 1514, after Charles had reached his 14th birthday. Meanwhile, Lord Lisle made a fool of himself by flirting with Margaret. There is little chance she truly favored him - certainly none that she planned to marry him - but they flirted, Henry translating for his friend. Once again, Charles Brandon was demonstrating his heavy-handed flair for the ladies. In the end, he greatly offended Margaret by encouraging gossip about their meeting. In particular, it stressed her attraction to him and a possible marriage. As a Hapsburg princess, she was not amused and Henry VIII was forced to make a public apology. But he was not angry with his friend; on 1 Feb 1514, he created Charles the Duke of Suffolk, the title once held by the Yorkist de la Poles. He also received the majority of their confiscated estates. This elevation was remarkable; it meant that Suffolk was one of only three dukes in the kingdom. The other two were Thomas Howard, Duke of Norfolk (reinstated to the title after his victory at Flodden in 1513), and Edward Stafford, Duke of Buckingham and descendant of Edward III. Of course, many were surprised that a yeoman's son was now one of their greatest peers but Brandon's friendship with Henry explained matters. In Europe, it was said that Wolsey and Brandon truly ruled England through influence upon Henry VIII. In 1514 as well, the usual tangle of European diplomacy had made Henry distrustful of the Hapsburgs. Also, the deadline for Charles of Castile's marriage to Princess Mary had come and passed with only dismissive explanations from the Emperor. So when Louis XII of France offered a peace treaty to England, Henry was eager to accept it. Louis considerably sweetened the offer by offering to wed the Princess Mary. For Henry, this was a diplomatic coup. For his sister, of course, it was considerably different. Mary Tudor, born 18 Mar 1495, was the baby of the Tudor family and widely considered the most beautiful princess of her time. She shared her brother Henry's exuberance for spectacle and was the star of his court. Like him, she loved dancing, masques, and parties; they were also close emotionally. So when Henry told her that she would marry the widowed King of France, a man in his fifties with gout and a pock-marked face, she poured out her heart. Certainly she would do her duty as a Princess, she told Henry, but when the marriage was over, she wanted to choose her next spouse - and choose him for love alone. It was an extraordinary demand for any woman of that time but Henry VIII loved his sister and he agreed. Why? Partly because he loved her but also because he wanted her to leave for France peacefully and willingly; and also, perhaps more troubling, because she had confessed her secret love to him - it was his best friend, Charles Brandon. In 1514, she was nineteen years old, very beautiful, and very willful. She had developed an attachment to Charles Brandon; she had known him all her life. It may have begun as a child's awe of a robust, attractive man, successful in all sports (so important at the Tudor court) and very charming. But it had changed into something more and, by 1514, most of the king's inner circle knew of her affection. There was no scandal, however. Mary believed her brother's promise and married the aged Louis XII at Greenwich Palace on 13 Aug 1514. The Duc de Longueville acted as the king's proxy - in every respect (he lay down on a bed with Mary and touched her body with his naked leg - the marriage was declared consummated). Mary eventually traveled from Dover to Boulogne on 2 Oct. Her husband met her at a carefully arranged 'accident' outside Abbeville and, on 9 Oct, they married in that city. On 31 Dec 1514, Louis died quite abruptly. BEF his death, he was visited by the Duke of Suffolk on a diplomatic trip and Charles wrote to Henry that his sister was discreet and dignified. This undoubtedly relieved both men; they had perhaps wondered how Mary would greet her true love. Mary, however, was aware of her position as Queen of France and, during her brief marriage, conducted herself with aplomb. The King of France's death changed her world considerably. Foreign country she had barely begun to settle in, she was suddenly pushed into strict seclusion for 40 days. This was French custom; after all, the widowed Queen might be pregnant and the child's paternity must be certain. Mary was not pregnant but she was sent to the Hotel de Cluny for her period of mourning, without even the comfort of her English attendants. The new King, Francois, had appointed several Frenchwomen to attend her and dismissed her women. Mary also had to deal with visits from the new French King, Francois I. He was twenty-one and knew the English-French alliance was breaking down. He did not want Mary wed by Henry to some Hapsburg prince. He suggested two of his own kinsmen as husbands and then hinted that Henry was trying to marry her to Charles of Castile again. Alone, and in her fragile state, Mary was terribly frightened; Francois's words touched on her greatest fears. She eventually confessed her love for Suffolk to Francois. Surprisingly, she found him sympathetic and kind. He promised to help secure her future happiness, a promise which Mary found generous and Francois found opportunistic. For, by this time, he knew the Duke of Suffolk was on his way to France to bargain for Mary's return, specifically the return of her jewels, plate, and dower rights. With the dowager Queen's confession, Francois had a powerful bargaining tool (and peace of mind; if Mary wed her English Duke, she was no longer Henry's political pawn). Charles had been sent to France by Henry, specifically promising to keep his relations with the widow on a formal basis. Henry had no reason to distrust him. Charles was his creation, dependent on him for everything, and also ambitious. Why would he bite the hand that so generously fed him? So Suffolk departed on his most important mission ever; it was well-known that the matter would be complicated. The French would not want to surrender any property to Mary and she would naturally want her rightful share. Beyond that, perhaps Henry meant to keep his promise. After all, he knew his sister's feelings - and now he sent her true love to bring her home. But rattled by Francois's suggestions of a Hapsburg marriage, Mary was set on a course which nearly ruined her and Suffolk. Suffolk arrived on 27 Jan; five days later, he met Francois at Senlis. Francois summoned Suffolk to a private audience and bluntly dropped his bombshell - the Duke had come to marry the Dowager Queen, had he not? Poor Suffolk was taken aback and protested vehemently. Francois went on to share Mary's confession and reassure the Duke. He was their friend, Francois said, and he would write to the English King and explain all. Suffolk took no chances; he dashed off his own account of the interview to Wolsey and then went to see Mary. It was a most emotional reunion. She accused him of taking her to England only to have her married off again against her will. He protested but she would have none of it. She issued an ultimatum - either marry me now or never marry me at all. There would be no better time, she said, for he had jealous enemies on the Privy Council who would prevent it in England. She had her brother's explicit promise that she could follow her heart and Henry knew her greatest desire. What was the risk for him, anyway? She was a princess and Queen, very beautiful, and imperious. Why would any man deny her? Suffolk was understandably torn between his obedience to Henry and his desire for Mary. But he was always ambitious and rarely foolish. He knew that Mary would be a great prize; after all, he harbored no overt dynastic ambitions but six years of marriage had produced no living child for Henry VIII. Perhaps Suffolk and Mary would create a new royal line. And she was a royal princess and Queen, just twenty years old and madly in love with him. Suffolk was swayed by tears and ambition and, sometime in Feb 1515, they married secretly at the Cluny chapel. The consequences were rapid and hardly comforting. Francois demanded Suffolk's acquiescence in several disputes over Mary's dowry as payment for their 'secret'. Meanwhile, Wolsey and Henry wanted the Duke to be firm and reject all the French king's demands. Furthermore, news of the wedding was circulating throughout Paris and Mary suspected she might be pregnant. Suffolk knew he could no longer delay confession and wrote to Wolsey, now Archbishop of York. He wanted to arrange a more public wedding ceremony since he knew their secret wedding could easily be invalidated (certainly he knew that better than most.) And he feared that the king's council was urging an annulment. Many didn't consider Suffolk a fit match for a princess and others wanted to promote pro-Hapsburg policy of which Mary's remarriage could play a part. But most important was Henry's reaction. How would he consider the betrayal of his best friend and favorite sister? Henry's reaction was not favorable. Brandon had written to Wolsey for support and he received a prompt reply but it hardly comforted him; the King could not believe his most trusted friend had betrayed him but, if it were true, the newlyweds had to pay a stiff penalty - literally. They must pay back the 24000 pds Mary's marriage portion in annual installments of 4000 pds, leaving her just 6000 pds to live on. She must return all the plate and jewels she had taken to France as her dowry as well as the many gifts King Louis had given her. Suffolk and Mary were wed again at Greenwich Palace on 13 May with Henry and Catalina De Aragon in attendance. There was feasting and celebration but it was strictly a family affair and foreign Ambassadors wondered if they should congratulate the couple. After all, the situation was odd and there were some (mostly on the king's council) who disapproved of the match. But, for the most part, there were no hard feelings or grudges. Suffolk was a popular man, good-looking and charming, and few - even in Tudor England - could resist such a grand love story. After all, they had risked everything to be together. BEF long, the Suffolks were back in the king's good graces. They are recorded as extending all the great court celebrations of the next few years. Mary's pregnancy in France had been a false alarm but she did become pregnant a few months later. In fact, she was now pregnant along with her sister-in-law Catalina. Due to the Queen's history of miscarriages and stillbirths, few were hopeful of the outcome; but, on 18 Feb 1516, she gave birth to her only surviving child, a princess called Mary after her aunt. The new duchess of Suffolk, however, was more fortunate - on 11 Mar 1516, she gave birth to a healthy baby boy called Henry after the King. Henry and Wolsey stood as the child's godfathers. Mary Tudor was closer to her foreign sister-in-law. She and Catalina had spent their formative years together. When, in 1517, Catalina went on a pilgrimage to pray for a son, Mary accompanied her. Both Mary and Brandon understood the Queen's most heartfelt desire - to bear her husband a prince and successor - and were sympathetic supporters. There as a passing cloud in 1516 - Mary's revenues from France had fallen off and she was behind in payment of her debt - but the cloud passed quickly. In early summer 1517, they were at Richmond Palace again. Mary was once more pregnant and, on 16 Jul 1517, she went into labor on her way home. A daughter was born, called Frances; the Suffolks had another daughter, Eleanor, in 1519. In 1518, Mary and Suffolk were at court again, attending the betrothal of the infant Princess Mary to the infant dauphin of France. And, of course, she attended the famous Field of the Cloth of Gold at Guines, near Calais in 1520. Back in England, however, things began to change. In the new year of 1522, Mary first met Anne Boleyn. She knew Anne's older sister Mary quite well; Mary Boleyn had been one of her ladies-in-waiting when she wed Louis XII in France. She had also remained in France until dismissed by Francois. Anne wanted to join Queen Catalina's household as a lady-in-waiting, a much-sought-after position. It is likely that Mary repaid Mary Boleyn's service by helping Anne. Certainly she may have liked the girl; Anne had spent time at the French court and was fashionable and high-spirited, much like Mary. Anne entered Catalina's service but was sent home in disgrace for three years. In just a matter of months, she had managed to attract the attention of Henry Percy, heir to the powerful Earl of Northumberland. The young couple entered into an understanding; however, Percy was under the guardianship of Wolsey. The king's most trusted advisor was understandably angry. Anne and Percy were brought to heel - there were better matches for him and she had overstepped her bounds. Anne was openly furious, so much that she was banished from court. However, she was allowed back in late 1525, around the time that Henry VIII was first beginning to contemplate his lack of heirs. Catalina de Aragon had delivered the Princess Mary in 1516, when she was thirty-one years old. Since then, there were no other surviving children. In 1525, she was forty and it was obvious she would have no more children. Her husband was nervous; his dynasty was just forty years old. It would not survive with just one princess as heir. He knew the problem was not his fault - after all, in 1519, a mistress called Bessie Blount had born a son. In summer 1525, this child, called Henry Fitzroy, was made the Duke of Richmond and Somerset. (Suffolk was present at the ceremony.) Catalina was normally a patient, dignified wife but the lavish ceremony, involving all the important nobility, offended her. She argued with Henry, telling him it insulted her and their daughter Mary. Henry was unused to such criticism and responded by dismissing three of her favorite ladies. The Suffolks were not critical of their benefactor - after all, he had created his nephew the Earl of Lincoln at the same ceremony. Also, Mary's repayment of her debt was still in limbo. She was also in failing health. She had suffered through the sweating sickness in 1518 and never completely recovered; it flared up occasionally. Her physical condition was deteriorating but she was also uncomfortable with her brother's course of action. In 1531, Henry banished Catalina de Aragon from court. He and Anne were constantly together and he made no secret of his intention to marry her. The Suffolks were not happy about this but what could they do? They depended on Henry for everything. Mary made a cutting remark about Anne sometime in early 1532 and refused to accompany Henry and Anne on a state visit to France. Her husband warned Henry that Anne may have slept with Sir Thomas Wyatt. But that is all they dared. They were concerned about their own family. By this time, Suffolk's daughters with Anne Browne were wed to titled men. His eldest daughter with Mary, the lady Frances, was engaged to Henry Grey third Marquis of Dorset (descendent of the famous Elizabeth Woodville; before Edward IV, she had been married to a Grey and had two sons by him. It was from the elder son that Henry Grey was descended. Of course, Frances and Henry were the parents of Lady Jane Grey.) The celebration of Frances's wedding to Henry Grey was held at the Suffolk home in London. It was Mary's last visit to the city. She was increasingly ill and also uncomfortable with her brother. His favor was no longer certain. He had married the pregnant Anne Boleyn in a secret ceremony. Suffolk was put in charge of the new Queen's coronation. Therefore, he was not with his wife when she passed away quietly at their home in Westhorpe on 26 Jun 1533. She was thirty-eight years old. Her death was not considered important news - most people were concerned with the impending birth of Anne Boleyn's child, destined to be Elizabeth I. Mary had seen her husband in early May but his duties kept him busy; it was a hurried visit and she simply wasted away in the next few weeks. Her husband replaced her quickly enough - and, as was typical of Brandon, with aplomb. He decided to marry his son's betrothed, Catherine Willoughby his ward and the daughter of Lord Willoughby de Eresby. She was a baroness in her own right, heiress to 15000 ducats a year. She was also just fourteen-years-old, the same age as his youngest child. Brandon himself was almost fifty. But he needed money badly and she was very rich; he married her quite rapidly (exact date unknown). His and Mary's son, the eighteen-year-old Henry Brandon, Earl of Lincoln, would be betrothed elsewhere easily enough. But that was not to be - after his father's wedding, the young Earl died, probably of the Tudor scourge, tuberculosis. His father was not particularly grieved - six months after his death, he and Catherine had a son and named him Henry Brandon (Sep 18, 1535 - Jul 14, 1551), and other son was named Charles in 1537, who died of the Sweating Sickness, 30 minutes after his elder brother in 1551. Suffolk was still in Henry's favor; the King gave his old friend the unpleasant task of persuading Catalina de Aragon to accept the break with Rome and the new title Princess Dowager. He was also to move her to Somersham near Cambridge, a well-known dank and unhealthy manor. Catalina would not be bullied; she told Suffolk that he would have to bind her in ropes if he wanted to move her anywhere. After a week of such talks, Suffolk left, having accomplished precious little. He never saw Catalina de Aragon again. He did attend all the momentous events of the 1530s - he sat at the trials of Thomas More and Anne Boleyn, he was even present at the scaffold when she was beheaded. He also helped lead forces to end the Pilgrimage of Grace, one of the most serious problems of Henry's reign. Meanwhile, his wife gave birth her second son, Charles, and his daughter Frances, after two still-births, gave birth to a healthy baby girl, named Jane Grey (probably after Queen Jane Seymour). The exact date of birth is not known, but it was probably Oct and eclipsed by the birth of Henry's son, Prince Edward. In 1537, he was the godfather of Prince Edward. The last years of his life were quite happy. He and Catherine Willoughby were affectionate, they had two healthy sons, the dissolution of the monasteries allowed the King to grant him more lands and pensions. He and his wife entertained the King and his new wife Catherine Howard; and, of course, Suffolk was one the men who arrested and extracted a confession from that Queen. He died quite suddenly on 22 Aug 1545, his last official business being plans for an invasion of France. But he was sixty years old, a good age at the time, and - once the news was known - it was not surprising. Suffolk requested a quiet funeral but the King would have none of it - he ordered a lavish ceremony at St George's Chapel in Windsor. Henry planned and paid for the service. It was undoubtedly an emotional occasion for him; after all, Charles Brandon had been his companion for virtually his entire life. In fact, Suffolk was one of the few men who could still remember the Bluff King Hal of legend. Henry was now overweight, bald, and suffering from a variety of physical ailments. He would only outlive his friend by about eighteen months. In that time, he had good cause to regret the death of his one true friend.